"December: a month of lights, snow and feasts." With December the cold weather arrived in Europe. It is icy and snowy and if you are not really a winter-person, you probably feel yourself best inside the house in a heated room. Wearing layers is a good idea in this season. You never know how the temperature will be in a building you need to make a visit for example and this way you can make sure that it is neither hot or cold for you. If you are lucky to live in a place where the winter is mild you can wear a nice poncho over your jumper and you are ready to go. But at other places you need to wear them under your winter coat. There are some sweaters in a style of a poncho which are perfect for layering. Above you can see some of my favourites. The colours I choose are neutral: grey and black. They can be worn with a lot of other colours and shades. You can create a lazy or an elegant outfit depending on the clothes, shoes and accessories you wear with them. It’s all up to you. 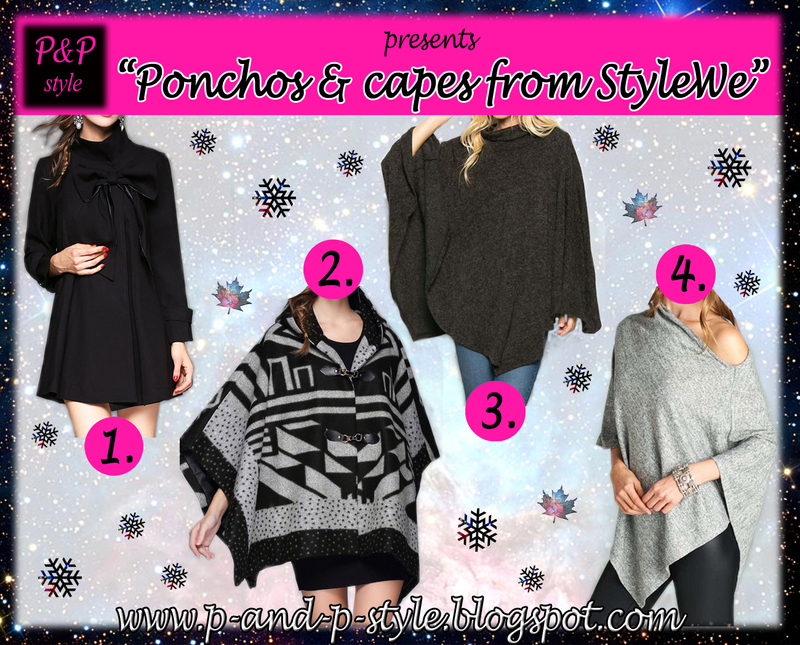 Grab yours now at StyleWe, just make a visit at the pages of fashion poncho and capes. You can also find them on Twitter and Instagram. Do you like to wear a poncho or a cape? Do you have one in your wardrobe at the moment? What do you think about the pieces on the picture? Loving the second one! Totally in love with its color and print ♥ Hope to hear from you soon! I love the cape style! I haven't tried it myself yet, but it's beautiful. Cool cape, I like it. I think loose fit tee shirt will fit it best.